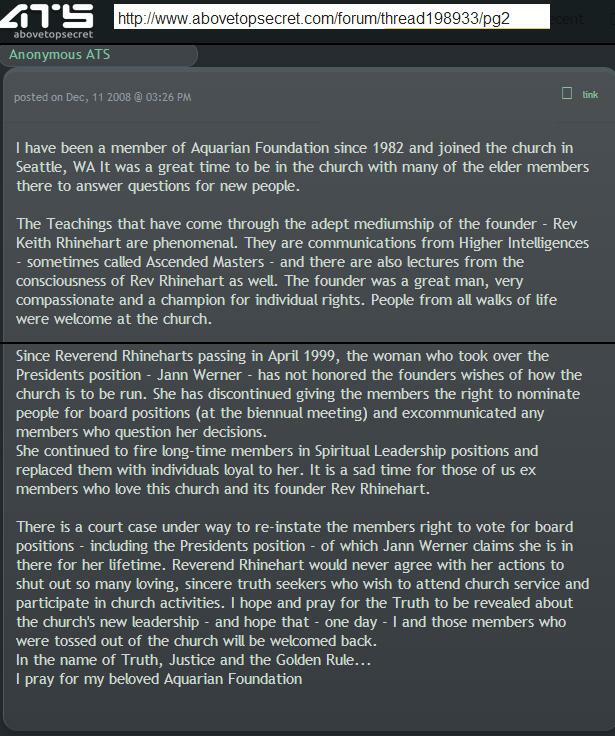 Jann Werner is acting selfishly, she is "killing" the Aquarian Foundation. She should stop all threats and complaints. The truth can not be hidden. KMR's wishes were contrary to the thoughts of Jann. "Members posting on any thread or topic are expected to act in a courteous, polite and respectful manner towards other members posts. On occasion, members may hold very different viewpoints, however, there is no excuse for personal insults, attacks or other forms of hostility in any debate, and such misconduct will incur censure. If offending is repeated, the member or members will receive a formal warning in the form of a Yellow Card and a private message will be sent to them by the Administrators notifying the member or members that their conduct breeches the forum rules and etiquette requirements."